Indigofera indica Miller (1768), Indigofera ferruginea Schum. & Thonn. (1829), Indigofera angustifolia Blanco (1837) (Djarwaningsih, 1997). 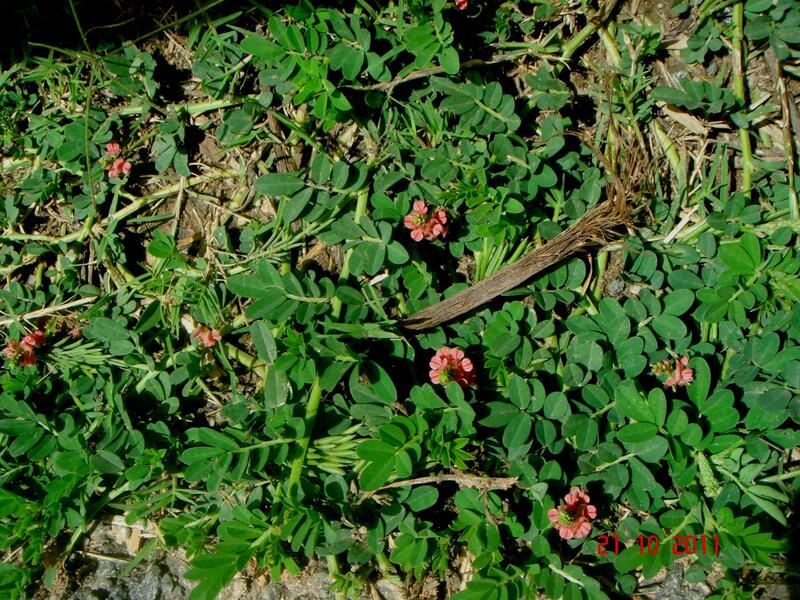 Hairy indigo (Indigofera hirsuta L.) is a subtropical and tropical legume shrub sometimes used as fodder. Indigofera hirsuta is an annual erect or spreading shrub, 0.3-1.5 m tall. The name "hairy" ("hirsuta") comes from the presence of very conspicuous brown and rusty hairs on the stems. The stems are erect, cylindrical and striate, and become woody as the plant matures (Djarwaningsih, 1997). The leaves are compound, imparipinnate, 2.5-10 cm long with 5-9 (-11) opposite leaflets. Leaflet blades are elliptical to obovate in shape, 4 cm long x 2.5 cm broad. The apical leaflet can be up to 6 cm long x 3 cm broad. Leaflets are hairy on both sides (FAO, 2016; Djarwaningsih, 1997). Inflorescences are hairy, many-flowered spike-like racemes, 20-30 cm long. Flowers are papilionaceous, hairy, red to pink in colour, about 4-6 mm in length. 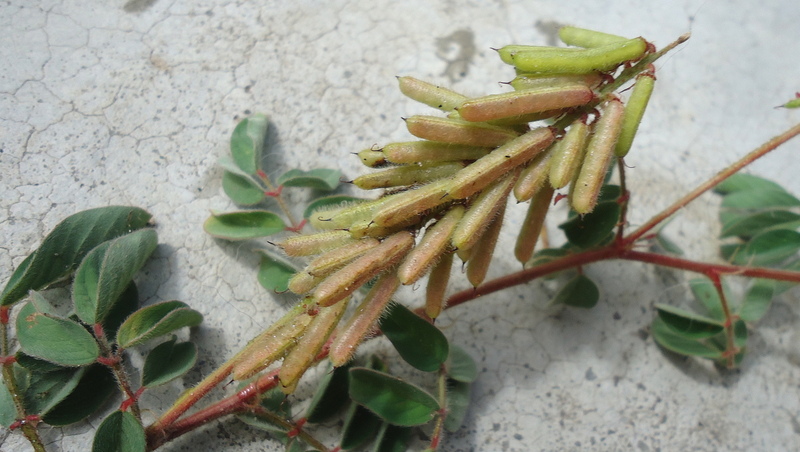 The fruits are straight, cylindrical dehiscent pods, 1-2 cm long and 1-2.5 mm in diameter. They contain (4-) 6-9 cube-shaped and blotched seeds (FAO, 2016; Djarwaningsih, 1997). Hairy indigo has been used as a green manure and cover crop in tropical plantations such as coffee, tea and rubber in Asia, and in citrus orchards in Florida. It may help as a cover crop where erosion control is required. It is used as an annual fodder in Florida and Brazil and can be grown in combination with grasses. 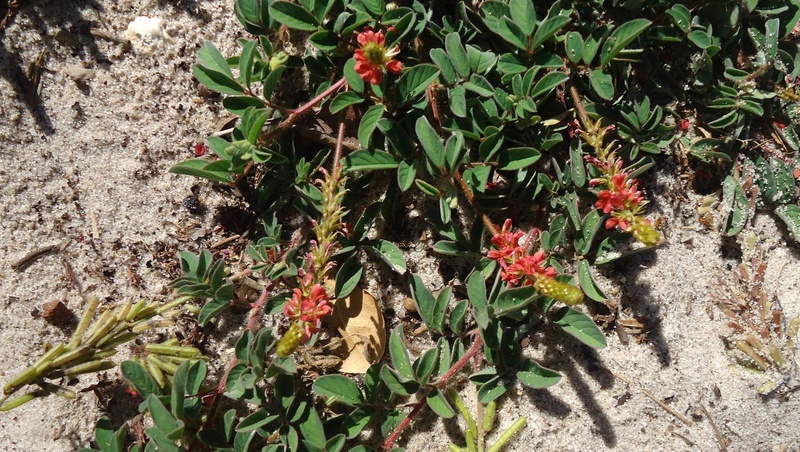 It can grow in the low fertile acidic soils of Florida. It has some resistance to root-knot nematode (see Environmental Impact below). It is reported to have value in ethnomedicine and is used as a dye in West Africa (Djarwaningsih, 1997). It is considered a weed in some situations, particularly in Florida (see Environmental Impact) (US Forest Service, 2010). Hairy indigo originated from Africa and Asia. It is now widespread and naturalized in Southern Asia and Australia. It was introduced into the USA at the beginning of the 20th century, where it was proved suitable for cultivation in coastal areas of Florida and Texas. It became naturalized in parts of tropical America. Hairy indigo is mainly found in cultivated areas, in grassland, savannah, dry and deciduous forests, and on river banks and beaches (US Forest Service, 2010; Djarwaningsih, 1997). Hairy indigo is found in both hemispheres, from 32°N in Georgia (USA) to 30°S in Argentina and from sea-level up to an altitude of 1350-1500 m in Africa (FAO, 2016). It can be grown where the annual mean temperature ranges from 15°C to 28°C and where annual rainfall is between 900 mm and 2500 mm. A dry season is beneficial to flowering and seed production. Indigofera hirsuta does well on a wide range of soils and is particularly tolerant of low fertile and low pH soils provided they are moderately to well-drained. It has neither waterlogging nor frost tolerance. It has some shade tolerance and can be grown in tree plantations, but it cannot withstand heavy shade (FAO, 2016; Djarwaningsih, 1997). Hairy indigo is a warm season legume. It should be drilled or broadcast during early or late spring. A well-prepared and firm seedbed is ideal but it may also establish without soil preparation. Cattle trampling and rain cover the seeds that take 7-9 days to germinate. Growth of seedlings is very slow in the early stages (Portillo et al., 2009). Weeding is necessary but not possible until 30 days after sowing as the seedlings are not recognisable among the weeds. It is not necessary to remove grazing animals from the stands where Indigofera hirsuta has been sown, a reduction of the grazing pressure being sufficient during establishment. After 50 days, hairy indigo is about 30 cm high and it reaches 60 cm after 65 days and 90 cm after 80 days (Djarwaningsih, 1997). 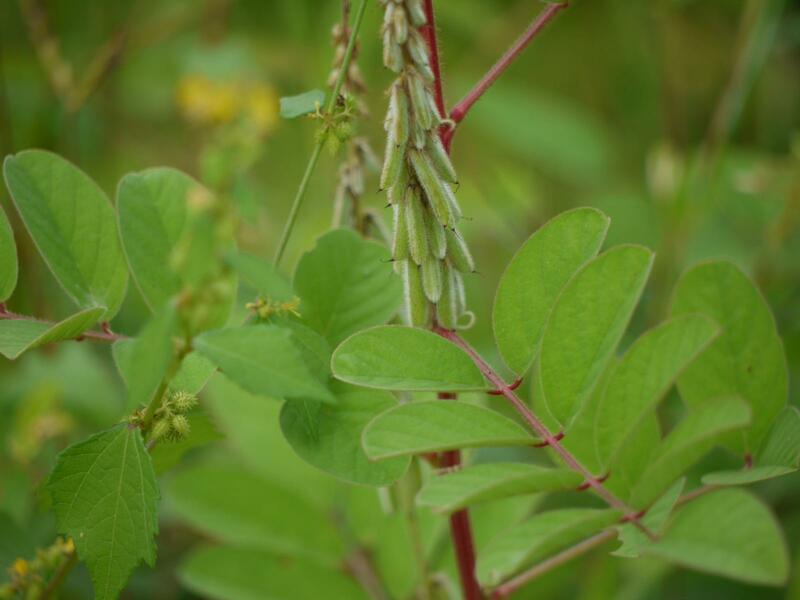 Hairy indigo can be harvested when it is 75-90 cm high but if 2 harvests are required the first can be at a height of 20-25 cm (higher cuts are deleterious to axillary buds) and the regrowth can be grazed or cut for hay. Rotational is preferred to continuous grazing. Hairy indigo intended for hay or silage should be cut at an early stage, before the stems become woody and lose their nutritive value (FAO, 2016; Djarwaningsih, 1997). Hairy indigo is an N-fixing legume that can provide up to 126 kg N/ha/year to companion grasses, and 100 kg N/ha to an undersown maize crop. In these maize-hairy indigo systems, it provides about 4-5 t DM/ha. Research on its utilization as green manure was discontinued in the 1990s (Djarwaningsih, 1997; Kalmbacher et al., 1980). When sown as a relay crop of maize, hairy indigo not only provides N and organic matter but it also protects the soil from erosion. Its role in erosion control may be important and it is recommended for hilly areas (Djarwaningsih, 1997). Hairy indigo was reported to reduce the number of nematodes when used as a cover crop or as an intercrop in rotation with legumes such as peanuts or soybeans (Rodriguez-Kabana et al., 1988; Rhoades, 1983). Hairy indigo is a very versatile species that re-seeds readily after fruiting, and may become invasive. In 1918, it was already declared a noxious weed in Australia (Gilruth, 1918), and it is now classified as invasive in many places, including Australia (where it is classified as "reject for import"), French Polynesia, Palau, Nauru, the Philippines, Singapore, Diego Garcia and Mayotte islands. It is a known weed in the USA (classified as a "high risk" species in Florida), China, Puerto Rico, and Brazil (CABI, 2014; Randall, 2012; US Forest Service, 2010). Hairy indigo forage is particularly rich in protein (14-27% of DM), with early cuts being the richest. In Florida, the protein content decreased rapidly with plant age (15% of DM at 86 days) and regrowth (12% of DM in regrowth of 90 cm) (Kalmbacher et al., 1980). In another study, protein content decreased from 16 to 6% of DM between August and November (Williams et al., 1993). In Uganda, protein decreased from 27% of DM at 4 weeks to 15% at 21 weeks. The NDF content increased from 35% of DM at 4 weeks to 68% at 21 weeks (Sabiiti, 1979). Indigofera hirsuta is not toxic to cattle (Sellers et al., 2013). Its tannin content can be high (over 10% of DM) and above the levels tolerable to ruminants (Ologhodoo, 1989). These tannins may have therapeutic effects for domestic animals, especially as an anthelmintic (Gaur et al., 2010; Suvarnalatha et al., 2013). Hairy indigo is a protein-rich forage that can be used for pasture, hay or silage. Information about its use is limited. In Florida, in vitro OM digestibility at the early cut stage was quite high (60%), but decreased with plant age (51% at 86 days), and with regrowth (43% after a regrowth with a height of 90 cm) (Kalmbacher et al., 1980). In another study, in vitro OM digestibility decreased from 53% in August to 37% in November (Williams et al., 1993). In Uganda, in vitro DM digestibility decreased from 61% at 4 weeks to 45% at 21 weeks (Sabiiti, 1979). Indigofera hirsuta has been used for pasture by cattle farmers in Florida from the 1940s but was not found satisfactory. In the 1970s, it was used to improve pastures, in association with grasses such as Bahia grass Paspalum notatum, pangola grass Digitaria decumbens or setaria Setaria sphacelata var. anceps (Kretschmer et al., 1973). It was then possible to reduce N fertilizer treatments (Hodges et al., 1977). Cultivars released by the University of Florida have been reported to be valuable for cattle grazing (Quesenberry, 1999). Early trials in Florida found that hairy indigo made acceptable silage for dairy cows (Becker et al., 1970; Wing et al., 1963). Other trials, however, found that the silage only met maintenance requirements and was not readily eaten (Catchpoole et al., 1971). Hairy indigo is one of the fresh forages used by Nigerian farmers to feed their rabbits in Benue State. Samples harvested during the dry season had high concentrations of protein and crude fibre: 24.1% and 24.3% of DM, respectively (Carew et al., 1989). Used as the sole feed, hairy indigo forage supported a medium growth rate, indicating that this forage can be used safely for feeding rabbits (Posri, 1985). Djarwaningsih, T., 1997. Indigofera hirsuta L.. Record from Proseabase. Faridah Hanum, I; van der Maesen, L. J. G.(Eds.) PROSEA (Plant Resources of South-East Asia) Foundation, Bogor, Indonesia. Randall, R. P., 2012. A global compendium of weeds. Dpt. Agric. Food Western Australia, 1124 pp.